provided in mountain huts with all the basic necessities. It usually takes 5 days/4 nights round-trip. The trek can be taken in 6 days/5 nights to add acclimatization with an extra day at Horombo Hut. Pick up from Arusha town or Kilimanjaro International (JRO) Airport and transfer to Moshi town. Half board accommodation at Bristol Cottages or Sal salinero Hotel in Moshi. After breakfast and a short tour briefing from the guide, we will depart to Marangu gate of Kilimanjaro National Park (it is a 50-min drive from Moshi to Marangu Gate). Upon registering with park authorities, our climb will officially commence with a five-hour walk to the Mandara encampment. We will pass through a thick rainforest zone, high chance of rain in the afternoon. We will spend the night at Mandara Hut (2,750m). Bathrooms are available with running water. Day 3: Horombo Hut (3,720m). Our trek continues past the final watering point, and ascends to the saddle of Kilimanjaro, between the peaks of Kibo and Mawenzi. The vegetation thins out as we enter the desert-like alpine zone (approx. 4,000m) and, once we cross the saddle, Kibo peak comes into view. The saddle is an alpine desert that resembles a lunar landscape. Be careful to notice signs of altitude sickness. This seven-hour walk will be taken at a slow pace. We will spend the night at Kibo Hut (4,703m), a comfortable stone construction (no running water at Kibo Hut). Few plants other than lichens and grasses survive in these conditions. Shortly after midnight, we will commence our climb to the summit of Kilimanjaro, since it is easier to climb the scree slope to Gillman’s Point (5,861m) on the crater rim when it is frozen and an early start for the 7-hour hike improves our chances of reaching the summit in time for sunrise. From Gillman’s Point, it is a further two-hour round trip along the crater’s edge to Uhuru Peak, the highest point in Africa. From the summit, it is downhill all the way to Horombo Hut (approx a 6 hour hike) where we will spend our last night on the mountain. Today’s descent continues past the Mandara encampment to the bottom of the mountain (approx a 6 hour hike, where each hiker will receive a well-deserved certificate. From here, you will be transferred to Bristol Cottages or Sal salinero Hotel in Moshi for dinner and overnight. Visa On Arrival is available for Indians at the Air Port on Payment of $ 50. Passenger should have Confirmed Air ticket and Yellow Fever Certificate along with other Travel Documents. For groups please provide travel itinerary. Onward visa and proof of funds or Sponsorship declaration from the sponsor in Kenya. Yellow Fever Vaccination Certificate is mandatory. Visa validity is for 3 months and period of stay is given at the time of entry into Kenya. The visa fee must be paid as a Demand Draft, in favour of “Kenya High Commission”, payable in New Delhi. In the Great Rift Valley palaeontologists have discovered some of the earliest evidence of man’s ancestors. 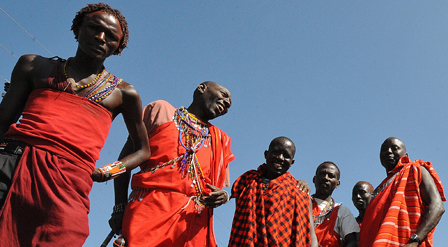 In the present day, Kenya’s ethnic diversity has produced a vibrant culture but is also a source of conflict. After independence from Britain in 1963, politics was dominated by the charismatic Jomo Kenyatta. He was succeeded in 1978 by Daniel arap Moi, who remained in power for 24 years. The ruling Kenya African National Union, Kanu, was the only legal political party for much of the 1980s. Other pressing challenges include high unemployment, crime and poverty. Droughts frequently put millions of people at risk. With its scenic beauty and abundant wildlife, Kenya is one of Africa’s major safari destinations. Kenya was shaken by inter-ethnic violence which followed disputed elections in 2007. Several prominent Kenyans stand accused of crimes against humanity for allegedly inciting the violence, and the authorities are increasingly sensitive to any attempts to stir up communal tension. The next elections, in 2013, passed off without violence and resulted in victory for Uhuru Kenyatta, the son of independence leader Jomo Kenyatta. Kenya’s military entered Somalia in October 2011 to curb the threat of the Islamist militant al-Shabab movement, which it accused of the kidnap and killing of tourists and aid workers. Kenyan troops are now largely integrated into the overall African Union forces in Somalia. There have been some reprisal attacks in Kenya itself. Naro Moru, Sirimon Gate, Judmaier Camp, Liki North Camp, Shiptons Camp, Point Lenana, Mintos Camp, Mount Kenya Meru Bandas. Mandara Hut 2700m. This is a group of comfortable, wooden A-frame huts. The largest cabin has a downstairs dining area and upstairs dormitory with bunk beds and mattresses; smaller huts sleep 8 each. The total capacity is 60. Water is piped into the site from springs above and flush toilets are behind the cabin. behind the huts. There are platform toilets 80m down the slope and new flush toilets within the complex of small huts. Kibo Hut 4703m. This stone house with a small dining-room & dormitory rooms has bunk beds & mattresses for 60 people. Visitors must be in possession of a valid visa (if applicable in your nationality) together with relevant health documentation upon arrival in both Kenya and Tanzania or may purchase a visa at the airport upon arrival. Different regulations do apply according to nationalities and countries of origin. It is recommended that all perspective visitors check with the nearest tourist office or diplomatic mission before any travel details are made. Medical centres in your country of origin will provide the necessary professional medical advice on all relevant health requirements. Generally, personal effects such as cameras, laptops, computers and films may be imported temporarily free of duty in Kenya and Tanzania. However a customs bond may be required for professional video equipment, sound recording instruments, radio communications equipment, musical instruments and souvenirs from other countries. This is to ensure that goods can be re-exported. Firearms need a special permit, which must be obtained well in advance. Excess baggage is strictly monitored by all airlines and charges for excess weight can be very high. Expect customs officials to inspect baggage on arrival and departures. Currency control regulations prohibit the export of local currency. There are no restrictions however on the amount of foreign currency a visitor may import. Only authorized foreign exchange bureaus and banks are permitted to transact foreign exchange. Both Kenya and Tanzania enjoy an invigorating climate and visitors need not concern for their general health during the course of their stay. By far the biggest risk is Malaria, which is endemic in certain areas. Anti-Malaria medication should be taken according to the advice from your local medical practitioners. Visitors requiring special medication should pack sufficient supplies in their hand-luggage. Chemists and pharmacies are generally well stocked, however the names of some generic medications can differ. Consult your medical practitioner for advice on alternative medication to take as some medication may not be readily available. Tap water is generally safe with in Nairobi, mineral water is available in most camps, lodges and hotels throughout Kenya and Tanzania (in many resort purified drinking water if provided free). Visitors to the region should take the same care as they would normally while visiting any other destination worldwide. By keeping vigilant, visitors can reduce the risk of incident. We do advise our clients not to take expensive jewelries on holiday with them and to watch hand bags, wallets and cameras when walking in crowed places. Walking at night in unlit areas is not advisable. We strongly recommend that all our visitors utilize safety deposit boxes when and where they are available for one’s peace of mind. All Travel Wild Safaris are based upon hotel, lodge or tented camp accommodation and as such do not require any level of strenuous effort unless stated otherwise. This said, Africa is, for the most part, a developing continent. It is therefore important to understand and accept that even the most meticulously planned safari or travel arrangements can go wrong and that conditions can dictate that there may be moments of discomfort and delay to your journey. Clients booking any of the arrangements in our tariff implicitly accept the above and make any such booking subject to the booking conditions and general information within this tariff. It is our policy to constantly review the services of the handling agents, hotels, lodges and camps we use. We cannot however, be held responsible for the results of delays and alterations, other than in these circumstances outlined within our booking conditions. We endeavor, wherever possible, to meet any special needs that our clients may have. Most hotels, camps and lodges within the region are prepared (given sufficient notice) to cater to special dietary requirements. For persons who are disabled in any way, we will do our utmost to cater to whatever needs may apply. We do require notice of any requirements, so please ensure that we are made aware at the time of booking. We recognize that many of our travelers may wish to take their safari or enjoy their beach resort in an atmosphere of complete privacy and anonymity. If you require a special privacy arrangement, please advise us well in advance. Thereafter we can assure that the appropriate privacy and protection measures will be put in place. The tour cost includes all the details listed within this tariff. Minimum 8 people must travel in a group. Accommodation – in first-class game lodges and tented camps. is specified in the tour outline. Collection/transfers – most tours start and end with the collection from and return to any centrally located hotel. Where air transportation is required and part of the itinerary, transfer services between hotels and airport are included (except Tanzania). Transportation by road—individual seats in safari minibuses or 4×4 vehicles. Transportation by air—based upon scheduled internal air services and all known costs are inclusive. For services in single or multi engine aircraft, costs are inclusive of air fares, domestic airport departure taxes and service charges. Guides – Services of qualified driver/guides. All driver/guides are certified through the Kenya Professional Safari Guide Association (KPSGA). Taxes and Fees – All government taxes such as hotel levies and services charges. Entrance fees to national park, reserves, sanctuaries and museums. Tour costs excludes porterage, gratuities to driver/guides, game rangers, local guides or incidental tips to hotel/lodge staff, bar and waiting staffs. All items of personal nature such as laundry and drinks. Airport arrival and departure transfers (in Tanzania) and any optional excursions not indicated in your itinerary. All prices are correct at the time of going to press. However, these are subject to increase in cases of force majeure, government tax and park entry fee increases and fuel surcharges. The correct price will be advised at the time of booking. Prices will also be quoted separately where safaris run from one season into another.